If you are a heave surfer of internet and keep on cleaning and maintaining your system you must have heard about CCleaner, It is one of the greatest System maintenance tool used for cleaning Junk/Temp Files and Registry entries. CCleaner is my favorite and among the best free tool who does the job. Now You can even increase the power of CCleaner further by adding more rules for cleanup and more software to scan during cleanup, yes that option is available in CCleaner and this is one of the biggest advantage of CCleaner, ie extensivity of it’s application scan base. To do that you have to add additional rules. 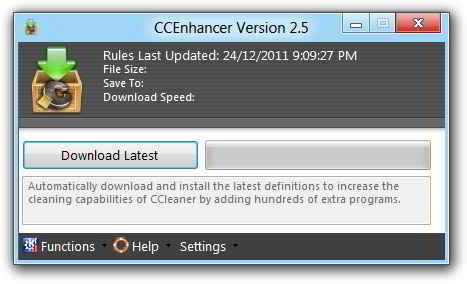 Don’t worry now you don’t have to do that manually for each of the application, here comes CCenhancer, which can add more than 500 Rules/Support for programs for automatic cleaning of Junk/ Temp Files. This Program uses CCleaner’s Winapp2.ini file to add more program and support for cleaning the file, Developer of CCenhancer have added these programs based on inputs from Support forum of Piriform (Developer of CCleaner). CCenhancer is a portable application, once you run it, it will ask you to download latest rule set and add them too CCleaner, next time you start CCleaner you will see all the additional software in scan list. There are many program which can be added by CCenhancer to CCleaner some of them are – SRWare Iron, Yahoo Messenger, WinRAR, Windows Update Logs, Windows Live Messenger, VLC, Winamp, uTorrent, Valve Steam Logs, Gimp, SMplayer, RealPlayer SP, Quicktime, MS Visual Studio, KMplayer, IMGBurn, Foxit PDF Reader, Foobar 2000 and dozens more. CCenhancer is a must for you if you are using CCleaner very frequently and also use a lot of programs which leaves traces behind as junk/ temp files which not only consumes space and system resources but also slow down your system.